When I became a mom, I was excited about getting a diaper bag. They make some pretty cute ones these days. Carrying a diaper bag around town is like a badge of honor showing you're a mom. Then I became a mom and realized what a hassle carrying one around can be. There is so much stuff to put in there so it's heavy and bulky. Then your shoulder starts to hurt, and because you wanted a cute one your husband is not a fan of carrying it for you. But, he'll definitely hand you stuff to put in it as well because of that's what you do. First, I had the traditional diaper bag. 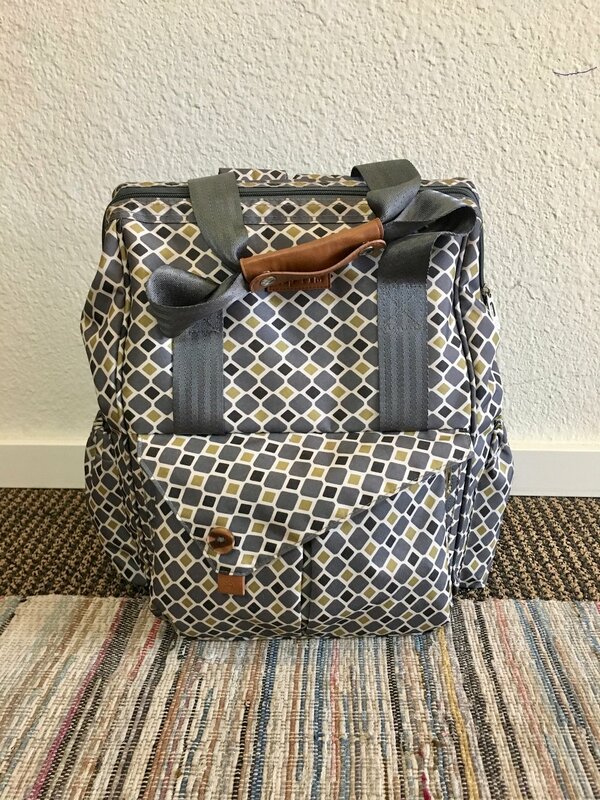 My first year and a half of motherhood was with my Ju-Ju-Be 'Legacy BFF' Diaper Bag. 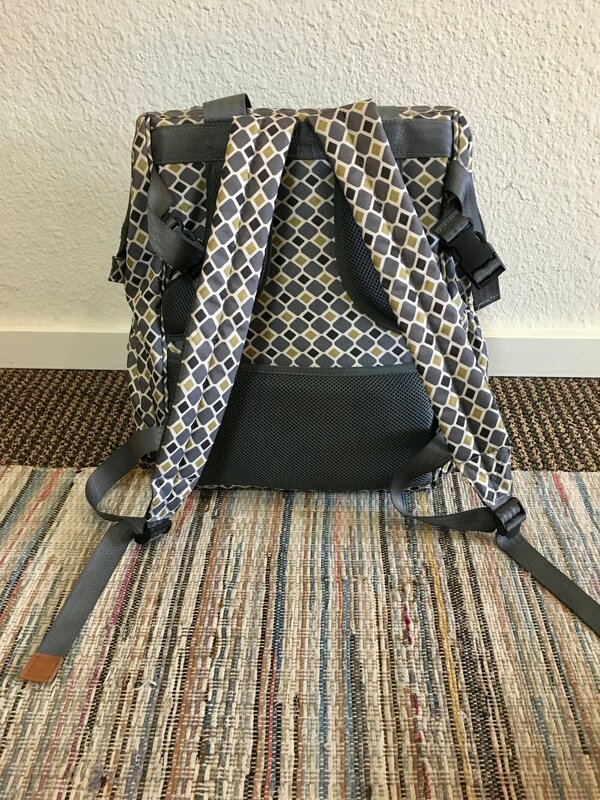 It was so freaking cute, had great pockets, and worked well as a diaper bag. While the zippers were great to keep everything inside, it seemed a pain to open them so often. I also just felt I needed a diaper bag refresh and something less diaper bag and more purse-like. Then, I had a shoulder bag. For Mother's Day, I got a new purse from Fossil and it was just my style. They don't carry my specific purse anymore, but it is similar to this one. I loved my new Fossil purse. The open top made it easy to take things in and out, it was spacious and looked good. However, It did lack pockets, so I would have to fish around inside to find something occasionally. Also, it was a shoulder strap. It would fall off my shoulder when I was carrying Caleb and land in my elbow nook, or my shoulder would get tired from carrying it too long. No fun. Now, I have a diaper backpack. Before our trip to Chicago, and knowing I was expecting another baby, I decided it was time to try something new. My good friend came over and I saw she had a diaper bag backpack. I'd heard good things about diaper bag backpacks, so I asked how she liked it and got the brand name from her. After looking it up, and thinking about it, I made the dive for a diaper backpack. Honestly, my friends, I haven't looked back. The backpack is great and I just know it's going to be so handy when the baby arrives. The lucky diaper backpack I got was the HapTim Multi-Function Baby Diaper Backpack (from Amazon). Why do I like my diaper backpack so much? Let me count thy ways. It's a Backpack: Thanks Captian Obvious. With a backpack, the weight is evenly distributed and the bulk is on your back so it's easier to move around. I found at the airport, it was easier to help carry other bags with a backpack on as well. Also, I have a squirrely toddler, so having the backpack makes me more capable of holding him securely or chase him more swiftly. No shoulder bag that keeps swinging forward and getting in the way! Padded Shoulder Straps: This makes it much comfier on your shoulders or longer wear. Structured Frame Top: There are metal bars that keep the top of the bag open, which makes it easier to find all your stuff inside. It's a nice wide opening and it stays open. So Many Pockets: Love the pockets. There are 13 total pockets! Two exterior side pockets: These are my favorite. Yes, I have favorite pockets. They can hold water bottles, sippy cups, or anything else you need easy access too. I put some wipes on one side and a water bottle on the other. Changing Pad: I don't need this right now, but I bet it'll be nice when our baby comes along. Stroller Straps: There are small straps on the top of the back that you can use to secure your backpack onto a stroller. Of course, a lightweight stroller might tip if you don't have the baby/toddler in the stroller, but with a more sturdy stroller, it works great. I'm pretty sure this function saved my shoulders when we were traveling in Chicago. Waterproof: In the Pacific Northwest, this is definitely a benefit. Although, not all colors/patterns are waterproof. Top Handle: There is a handle on top with a leather strap for picking up the backpack or hanging it. Honestly, this is great in the restroom when you don't want to place it on the floor...you can just hang it on a hook! Now, I know there are other diaper backpacks out there, maybe too many, and I'm sure they all work great. I just happen to like mine so far and wanted to shout it to the world. While it's a great backpack, I still wanted to organize it more. The diaper backpack has a nice, big space in the main bag so I wanted to find a way to organize the items I planned on having inside. 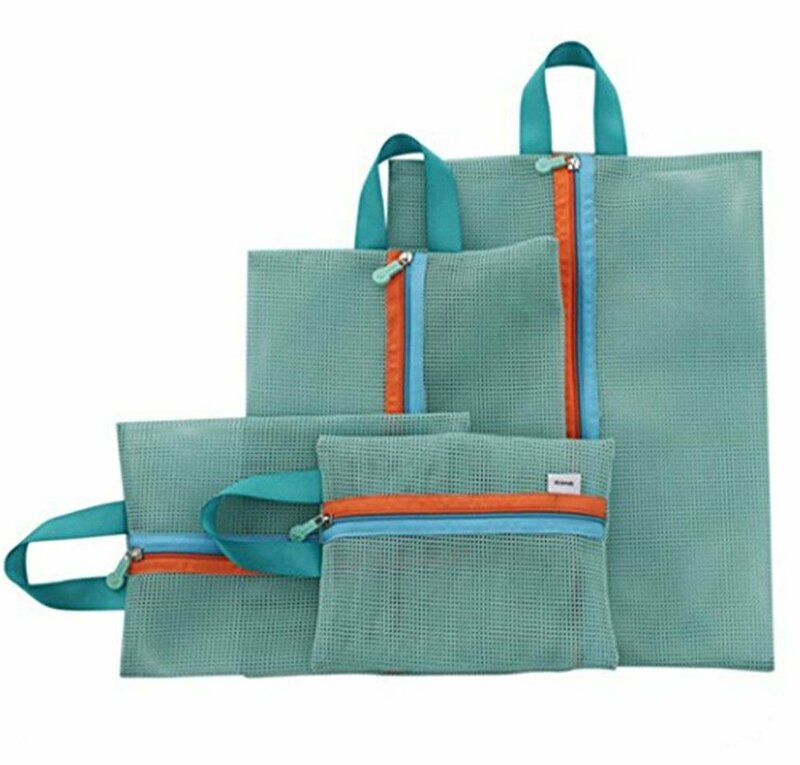 As I roamed Amazon, I came across these UNKE 4pcs Travel Zip Pouch Tidy Luggage Packing Organizer Bags. I loved that it came with various sized bags, I could see what was inside with the mesh material, and they had handles for easy grabbing. Not to mention, a great price. They took a while to ship, but that wasn't a huge deal breaker for me. They come in two colors: green or pink. I opted for green since I'm a mom of boys and I just happen to favor the teal-ish green color. They have been working great so far. 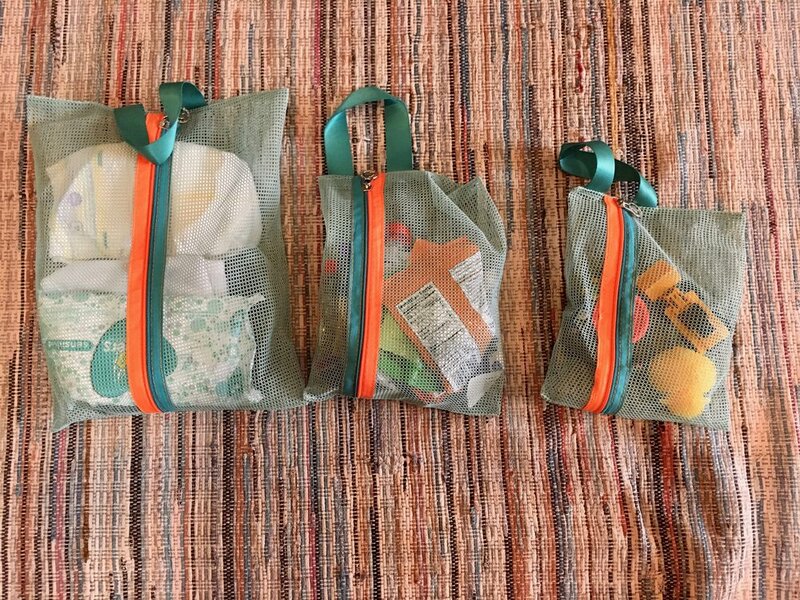 Each bag has a purpose: (1) little toys, (2) snacks, (3) diapers + wipes, and (4) spare change of clothes. Here's a peek at how these organizer bag look. There is enough room to throw in a jacket for Caleb and sometimes I'll throw in other things as well. Right now, you'll see I am also carrying a portable potty seat. I have the OXO Tot 2-in-1 Go Potty for Travel and it's been a lifesaver with potty training. I also just stuffed a bunch more things for the flight I took down to San Diego. Of course, the below still happens. Rocks found at the bottom of the bag - aka little gifts from Caleb. Precious stones...if only. So, what bag do you use? Are you tempted to switch to a backpack? Do you have a backpack and love it? Disclaimer: This post may contain Amazon affiliate links to products. I am a participant in the Amazon Services LLC Associates Program, an affiliate advertising program designed to provide a means for us to earn fees by linking to Amazon.com and affiliated sites. I only share products I have bought and/or tried and would recommend.